Hosted by Manchester University NHS Foundation Trust, the Academy is a collaborative national programme involving multiple other training centres and NHS Trusts around the country as well as Health Education England, Public Health England, the Royal College of Radiologists, the Society and College of Radiographers and e-Learning for Healthcare. Use the pooled expertise and experience of the breast imaging community to deliver world-class training. 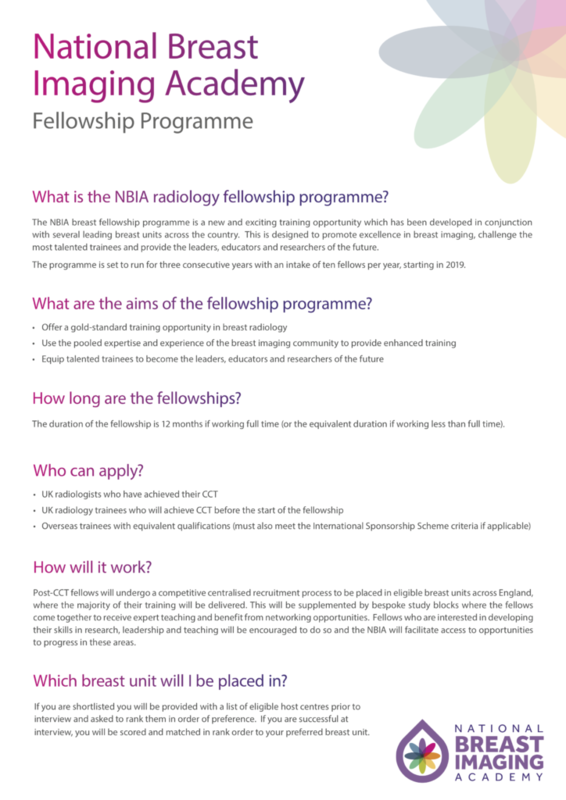 These are post-CCT posts and are therefore open to radiologists who have achieved their CCT (or equivalent) or will do so before the start of the fellowship. The first cohort of ten national fellows are expected to commence in post in September 2019, following a centralised interview and recruitment process in spring this year.